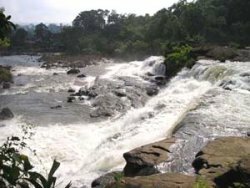 In this itinerary you will get some impressions from the Laotian capital, then fly the distance from Vientiane to Pakse, continue overland and visit some of the most interesting sights of the south. 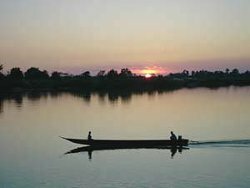 On the last day you will cross in to Thailand and the tour ends in Ubon Ratchathani, where you can continue your journey. 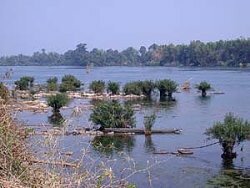 Daily, minimum 2 persons, private tour from Vientiane to Ubon Ratchathani. Upon arrival transfer to the hotel. In the afternoon take a tour in the Laotian capital and visit the most interesting sights, such as That Luang Stupa, Wat Sisaket and the central market. Travel on towards Pakse. Here board a long tail boat and travel for approx. 1,5 hours down the Mekong. 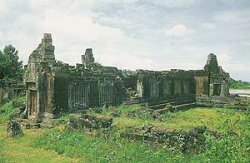 On the way visit the Angkor temple of Vat Pou. This ancient stone palace is an architectural marvel. Continue on the road to Hat Sai Khone. 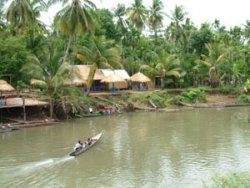 With another boat you will cross the Mekong and reach Khong island, where you spend the night. Continue by boat in southern direction to the 4000 river islands. In Don Kone switch to the car. On route you can see remains of the French's occupation, such as old locomotive and railway line. Enjoy a short walk through tropical vegetation until you reach the Liphi waterfall. 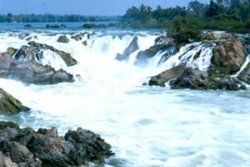 Early afternoon you will arrive at the huge and spectacular Khone Phapheng falls, where the Mekong takes a deep just before the Cambodian border. Finally drive on the road for approx. two hours to Paskse. Overnight. In the morning visit the local market and take a stroll through the province capital. Later travel to the border town of Chong Mek and cross in to Thailand. From here transfer to the city of Ubon Ratchathani, where you can continue your journey, for example by flight or night train to Bangkok. More information or booking of this tour! Siam Sun Tours Ltd. Part. is a registered tour operator with the Tourist Authority of Thailand (TAT) licence no. 23-0260. During a tour booked with us, all participants are insured with AVIVA Insurance (Thai) Co. Ltd.